The ability to flow gas or power between locations allows companies to optimise and balance their portfolios and take advantage of locational price disconnects. Companies are becoming more sophisticated in how they value transportation capacity purchases and investments and how they operationally hedge and optimise existing capacity. However effective implementation of the spread option approach that is increasingly common in valuing transportation capacity, presents some interesting challenges. We explored in a recent article the crucial role transportation capacity and interconnectors play in European gas and power markets. The ability to flow gas or power between locations allows companies to optimise and balance their portfolios and take advantage of locational price disconnects. Companies are becoming more sophisticated in how they value capacity purchases/investments and how they operationally hedge and optimise existing capacity. This article provides an overview of the dynamics of capacity valuation and the most commonly used hedging strategies. It also explores the use of a spread option approach to value and hedge capacity and some of the practical challenges in implementing this approach. Market price dynamics, specifically price volatility and correlation, that drive the option or extrinsic value of capacity. Table 1: Transportation capacity hedging and optimisation strategies. A common approach to valuing and hedging capacity is by modelling it as a spread option. This approach is popular because it captures the key dynamics of the problem (stochastic prices at either end of the capacity and the flow/no-flow decision). There are several closed form solutions to the problem (Kirk, Margrabe and Bjerksund/Stensland), making it easy to implement. However, there are some important challenges to successfully implementing a realistic valuation approach. One criticism of using spread option models to value capacity is that they do not adequately capture the true pricing dynamics between physically connected markets. To explore this it is important to consider the underlying market fundamentals. In the first state, prices will be at or around parity with no structural price differences to generate value. In markets with a high degree of physical interconnection, such as the European power and gas networks, it is common for many capacity lines not to be fully utilised (i.e. they are unconstrained) for a lot of the time as flows are optimised to take advantage of any price differentials. Although it is worth noting that even when flows are unconstrained, there may at times, and for short periods, be apparently profitable price divergence due to market benchmark distortions or inefficiencies. The second state is important from a value perspective in that it provides the conditions for prices to become decoupled. Even if these conditions are only in existence for a small proportion of the time, very large profits can be made from infrequent events. When the capacity is constrained or close to becoming constrained, unexpected changes in the market fundamentals can cause extreme but short-lived price divergence. Under these conditions capacity owners can recover a large proportion of their cost in short periods of time. The standard closed form spread option models do not account for different system states. They allow a single price process at each end of the capacity with the relationship between price movements governed by a single correlation parameter. The challenge then becomes how to define a meaningful value for this parameter. If the correlation parameter is too low the extrinsic value can be significantly over valued and if it is two high it may not adequately capture the value that can be created when capacity is constrained (or under values the “fat-tails” of the distribution). This issue also needs to be considered for the hedging strategy of capacity. If forward prices are at parity (i.e. the option is “At-The–Money”), a simple interpretation suggests there is roughly a 50% chance of it being profitable to flow. 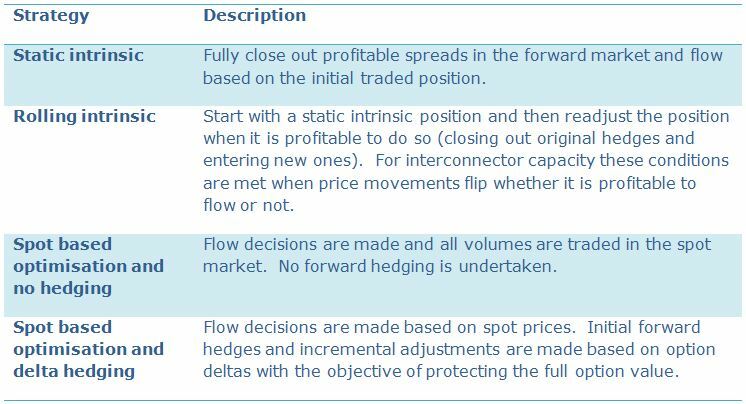 Under a delta hedging approach, an initial long and short position would be created at each hub to create a “delta-neutral” position (∑(delta × capacity + hedges) = 0 for both hubs). However, if the capacity remained unconstrained, the option deltas will trend to zero requiring the initial delta hedges to be incrementally unwound. The net result of the strategy would be equal to the cost of the bid/offer spread. Under these conditions the logic for using delta hedging is questionable and spot based or rolling intrinsic strategies may be more appropriate. It is worth noting though that the mathematical definition of the option delta is more complex and its calculation is impacted by other factors such as the relative volatilities and strength of the correlation. Even considering these challenges, valuing transportation capacity using spread option models is still a valid approach given the relative accessibility and transparency of the methodology. The biggest challenge is not which model to use but how to structure the analysis such that it mirrors the real world problem faced by the asset optimiser or trader. Market dynamics that need to be considered include accounting for bid/offer spreads, market liquidity constraints and the granularity of the exercise decisions facing the option holder. Of these, inappropriate exercise decision granularity has the greatest risk of invalidating the integrity of the analysis. The most common mistake here is to model the capacity as a strip of options at the granularity of the market settlement period (typically daily for gas and hourly or half hourly for power). Whilst in theory this is the granularity at which the option holder can make his/her exercise decisions (to flow or not flow) such an approach typically substantially over estimates value. The reality is that at any point in time the option holder can only really consider the exercise decision at the granularity of the tradable products available to hedge the position. For example, consider a gas capacity contract for 1 year that starts in 18 months. Initially the contract period may be covered by two seasons, as it gets closer to delivery the seasons will cascade into quarters, quarters into months, months into within month contracts until, finally, cascading into the individual day which aligns to the actual exercise decision available to the capacity holder. Structuring a series of equivalent cascading spread options offers a more realistic valuation. Diagram 2 illustrates the concept for a winter capacity contract and shows how options on different delivery periods are constructed to match the availability of the tradable products. Initially only a season contract is available to trade covering the entire delivery period so the initial option available is on the full season. As the quarterly contracts begin trading the option on the season is replaced by an option on each quarter. 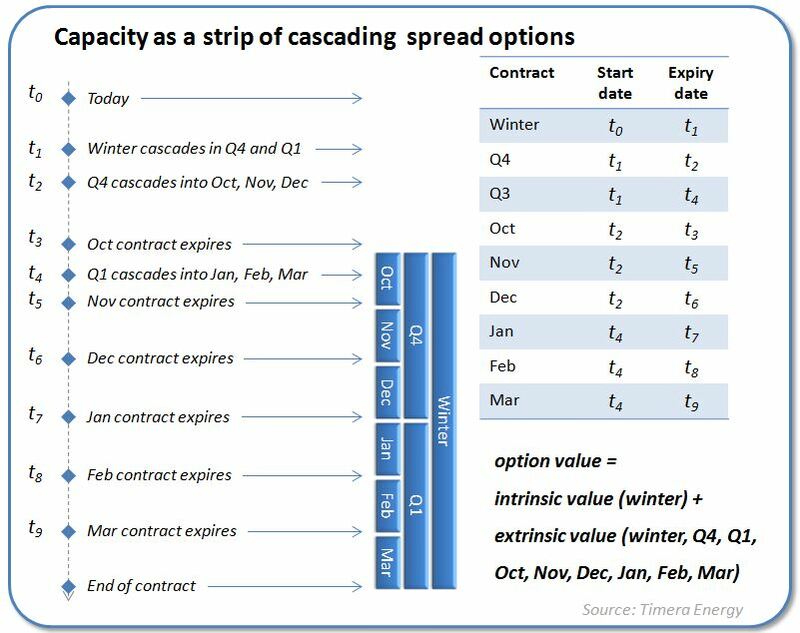 At each cascade event one option expires and another becomes available such that there is only ever one active spread option at any point in time. The value of the capacity is calculated as the intrinsic value implied by the initial forward curves plus the sum of extrinsic values of the cascading options. Another advantage of this approach is that it simplifies the task of estimating the input parameters. All of the standard spread option models require single input values for the volatility in each market and the correlation between them. However, over the typical holding period of the option, both of these parameters will be dynamic. The declining volatility term structure (accentuated if spot volatility is high) means it is not straightforward to calculate a single average volatility for an option that has a lengthy time to expiry. Similarly, correlations are also likely to vary as a function of time to maturity. For example, markets that are close to delivery are less able to rebalance in the event of unexpected changes of fundamentals, increasing the chances of prices decoupling (and reducing correlation). European gas and power market participants have become far more sophisticated in their treatment of transportation capacity in recent years. The value of the embedded optionality of capacity is increasingly being reflected in capacity prices and relied upon to drive investment in new capacity. Companies are also increasingly representing the forward value of capacity on a mark to market basis in their accounts as opposed to treating it as an operational cost and accounting for it on accrual basis (i.e. realising cost incrementally through the contract period). Closed form spread option solutions offer an easy to implement valuation framework but there are several pitfalls that can significantly compromise the analysis. Ultimately a strong commercial understanding of the underlying market dynamics and the hedging and optimisation of capacity are essential to effectively analysing value.